I’m doing a bit of multi-tasking this afternoon. My computer desk and sewing machine table sit next to each other so I’m alternating between listing some new fabric fish in my OddSox Folksy shop, and sewing together some fabric baskets with freemotion birds on the front. The fish are made from a collection of really lovely fabrics. The 100% cotton fabric came as a ‘jelly roll’ (I think that’s what it’s called anyway) – which is about 40 strips of complementary patterns and colours 44″ long x 2.5″ wide from the ‘Howard Marcus for Moda’ range. I think they are often used for quilt making but I don’t have the patience to make such a large item so fish it is! 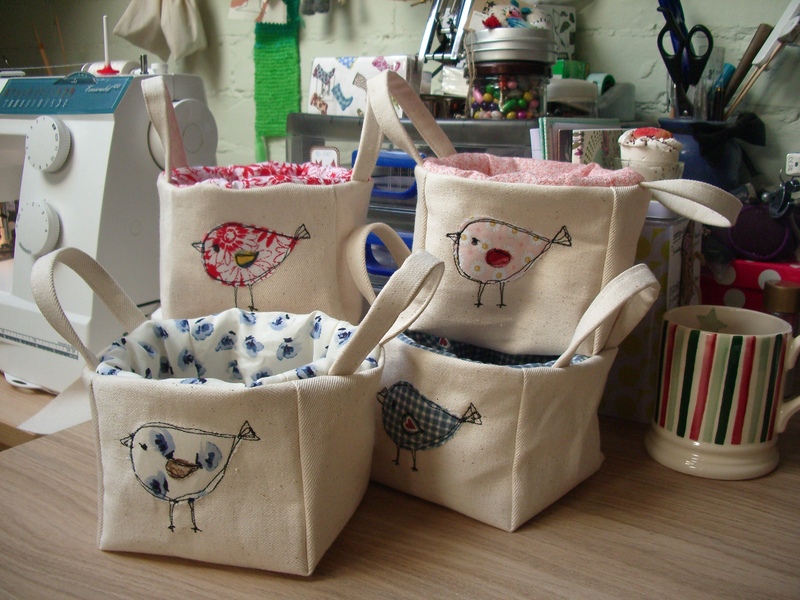 This is my first batch of fabric baskets, they just need to have the ‘turning inside out hole’ sewn shut by hand. These will be coming along to my craft fairs which start next month. After the fish listing I’ll be putting more new sock creatures and amigurumi cuties into the shop over the next couple of days – please do pop by and have a look.